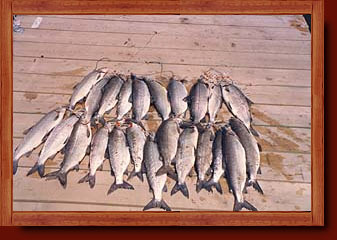 Ivanhoe Lake is stuffed with Whitefish. In the spring they are found everywhere. They also fight really hard and can be a lot of fun. Usually after the May Fly hatch (Late May or Early June), the Whitefish go deeper but can still be taken in the deep water with tiny jigs or fishing straight down with a hook, sinker, Dew Worm or Waxworm.